The key message of Figure 2.2 is that, in considering growth policies for the Central Ontario Zone, one cannot focus on either the land-development process or the transportation system in isolation from one another. 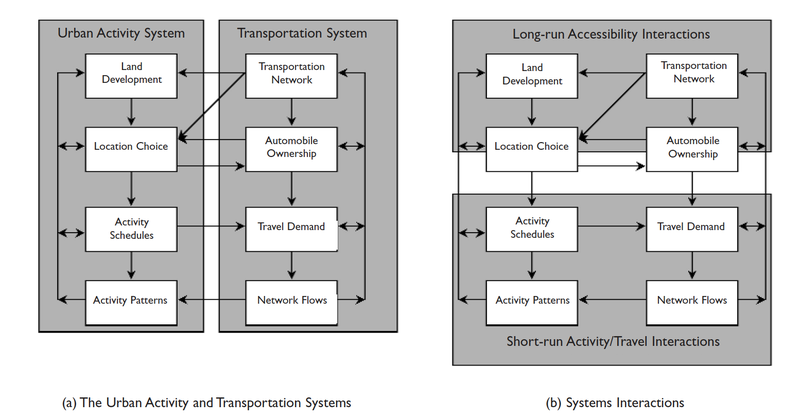 If land development occurs without consideration for its implications for the demand and supply of transportation services, we may develop in a way that locks us into a transportation system with fewer benefits and greater economic, social, and environmental costs. At the same time, transportation-based solutions to problems of congestion or environmental degradation may be ineffective or infeasible in the absence of a land-development pattern and process that supports these transportation alternatives. Unfortunately, it can be argued that over the last two decades or more in the Central Ontario Zone, little effective, practical attention has been paid to the realities and ramifications of the transportation-land use interaction in the way the region has been allowed to develop and grow. Development has generally occurred in ways that have directly exacerbated, rather than ameliorated, transportation-related problems of congestion and pollution, despite brave words in most municipalities' official plans and other planning documents concerning "sustainable development" and "smart growth." That is, although most municipalities have explicit policies that support sustainable, smart growth, actual development patterns, in too many cases, are not consistent with these policies. A development approval process that has permitted the proliferation of both housing and commercial developments in a dispersed and uncoordinated pattern that is extremely difficult to serve in any attractive, cost-effective way by transit and hence requires those who live and work in the developments to depend on automobiles for transportation. Transportation costs (in terms of congestion, pollution, greenhouse gas emissions, and accidents) have not been considered in any practical, effective way in the approval process. A largely unquestioning acceptance of road- and automobile-based urban design, both at the macro level of selecting sites for development and at the micro level of the layout and land use mix of residential neighbourhood and employment centres. Although municipal policies often strongly support developing transit-friendly environments, mechanisms for accomplishing this are rarely spelled out. As a result, the design and location of residential subdivisions, office parks, and other commercial establishments typically turn out very auto-oriented. Difficulty in thinking creatively about new means by which social (quality of life) and economic objectives associated with land development and regional growth can be met while improving the sustainability of the transportation system and its use. Again, presumably a major motivation for bringing Central Ontario Zone municipalities together within the Smart Growth Panel is to address this issue in a more constructive and effective manner than has generally been possible to achieve individually over the recent past. These issues will be explored further in this report. First, we provide some empirical evidence on recent trends in travel behaviour within the Central Ontario Zone and their linkages with regional structure and development trends. The remainder of the report deals with policy options and issues that might address some of the concerns raised above and that might contribute towards a transportation-related smart growth plan for the region.